One thing I was looking forward to in moving back to France was easy access to incredible, fresh, crunchy “baguette”. A bland, flat bread, not much better the one sold by supermarkets in the US. What happened to the world renowned French baguette ? The price of bread is not government imposed since 1978, but it is still very much monitored and controlled by consumer associations. The result is that the price of the traditional French loaf varies very little throughout France, around 0.90 Euros in bakeries, around 0.45 Euros in supermarkets. Hence, the bakers use the cheapest ingredients to keep it low cost. And some people apparently like that taste because “le pain” (the bigger loaf of French bread”) and “la baguette” still sell like… hot cakes (pun intended). Of course, it’s a question of taste. The regular “baguette” is very light: it’s crust is dry and crunchy but thin, the inside is light and soft. And it doesn’t keep well more than a day. If you are indeed looking for good bread, then go to a boulangerie – although some small countryside supermarkets carry breads from a local bakery… and big supermarkets may have their own in-house bakers… so you can actually find good bread at your French local supermarket… But I digress. Ask the baker what their own version of the baguette is; “comment s’appelle votre baguette spéciale ?“. or my personal favorite “la croquise”…. To know which one you prefer, only one solution: try them all! And if you ever wondered why there is “une boulangerie” (a bakery) at each corner in France (in Paimpol, we’re 8000 inhabitants for 5 bakeries + all the supermarkets). It’s because of the baguette differences. French people will have their favorite bakery which bakes their favorite baguette, and they’d seldom go anywhere else. The bread will be crunchy outside,”la croûte” (the crust) will be more or less thick, with or without flour outside. The bakers will use different flours, and make “la mie” (the white part) soft and airy, or heavier with more substance. 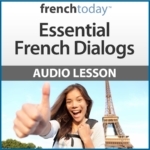 4 – Why The Different Shapes of French Bread? The shape of the bread has to do with its conservation. The bulkier, the longer it will stay fresh. Some shapes are more for decoration purpose, or to be able to easily tear up individual portions, such as with “l’épis”. French Baguette typically will not keep more than one day. And you can order for half a baguette: “une demi-baguette”! Now that you know why you should always ask for the bakery specialty baguette, here is another article I wrote about the French bread vocabulary.